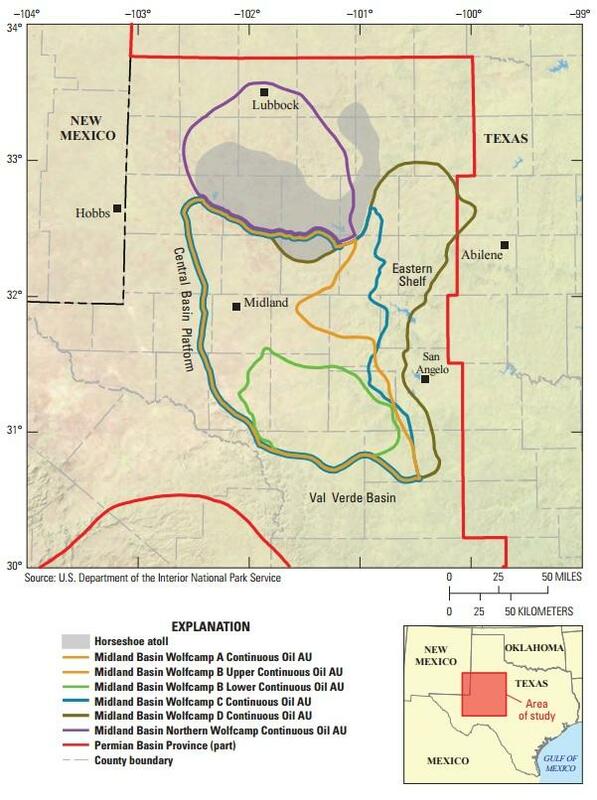 So, the USGS comes out with a press release that the media immediately diffuse in terms of a great discovery: 20 billion barrels, somewhere in Texas in a place called “Wolfcamp”. Bloomberg multiplies the number by the current oil price and comes up with a title that reads: “A $900 billion Oil Treasure,” for a piece that tells of “bonanza” and of “the gift that keeps on giving”. USA today speaks of “The Largest Oil Deposit Ever Found in the US“. And how about the comments? Just a few examples. As our new President will do – DRILL BABY DRILL!!! Energy independence – that sure has a nice ring to it. Middle finger to Middle East arabs. I remember in the late 70’s when scientists said we would be running out of oil by the late 90’s. I wonder where those scientists are working now? Climate change? Great fun, and all fact-free! But let’s suppose, for once, that facts mattered. What should we say about the “Largest Oil Deposit Ever Found in the US”? One point is that nothing new was “found;” the Wolfcamp formation was well known and already being exploited. The USGS just made a new estimate; probably valid within the assumptions made; but it is just that: an estimate. It doesn’t mean that these resources have been discovered (note that the USGS explicitly says “undiscovered.”) So, what all this means is that, statistically, these resources should be there, but nobody can be completely sure and it wouldn’t be the first time that these estimates turn out to be optimistic. (in this case, the round number “20” is more than a little suspicious). But never mind that; let’s assume that these 20 billion barrels are there for real. How does this amount stack up in comparison with the world’s oil situation? Here are some data, taken from Bloomberg (not exactly a den of Cassandras). Let’s compare these data with the world’s oil consumption that, according to “Index Mundi,” is today a little more than 33 billion barrels per year. So, you see from the figure that, during the past decade at least, we have been consistently burning more oil than we could discover. Now, if there had been other major discoveries this year, they would have been trumpeted enough that we would know of them. So, adding the 20 billion barrels of the Wolfcamp formation to the meager total of 2016, probably, we still don’t reach a total of 33 billion. 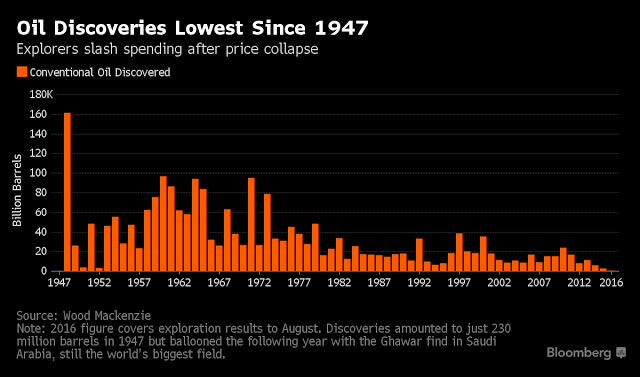 In the end, all that we can say is that, for this year, oil discoveries were just a little less, rather than much less, than what the world has consumed. These would be the news, if facts mattered. But, that’s not even the point: the essence of depletion is not how much of it there is, it is how much it costs to extract it. Here, Arthur Berman notes that Bloomberg had calculated the value of this “treasure” at $900 billion as if “if the oil magically leaped out of the ground without the cost of drilling and completing wells; if there were no operating costs to produce it; if there were no taxes and no royalties.” Then, Berman calculates how much it would cost to extract all this “bonanza” of oil and concludes that, at the current prices, it would result in a net loss of some $500 billion. So, aren’t you happy to live in a fact-free world? You can keep thinking that it is enough to poke a few holes in the ground to see it gush out in never ending abundance because, as everyone knows, it is really “abiotic.” Sure, and you can also walk on thin air, as Wile E. Coyote can do as long as he doesn’t realize he does. The article is self explanatory. The graphical representation of resources available reflects the growing crisis.